All About Reading is a fun and engaging program that has everything your student needs to become a fluent reader for life! Get ready to make reading your student's favorite subject of the day! All About Reading is a delightful, developmentally appropriate method or learning to read. 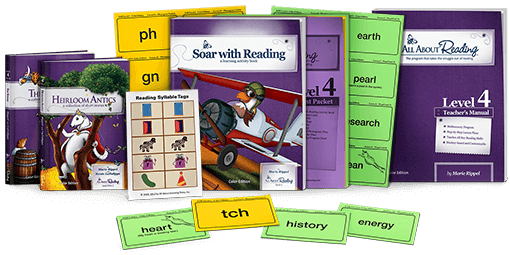 This scripted, open-and-go program was developed for busy parents, teachers, and tutors who want to teach reading in the most effective way possible. Choose a level or placement test below to get started. First of all, you can do this! 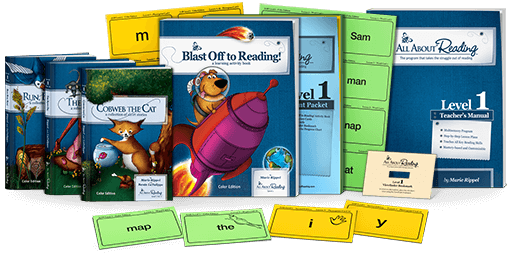 All About Reading is a scripted, open-and-go program developed for busy parents, teachers, and tutors who want to teach reading in the most effective way possible. This program doesn’t require long periods of study, you don’t have to develop your own lesson plans, and you don’t have to stress over what to teach next—because everything is laid out for you, step by step. You’ll get solid grounding in how to teach reading without being overwhelmed. You get free lifetime support. You don’t have to do it alone! If you ever have a question as you are teaching reading, we are just a phone call or email away. Most importantly, All About Reading is committed to results. The All About Reading program has a very focused mission: to enable you to teach your student to read while guaranteeing retention and enjoyment. Our approach to reading focuses on enabling students to become confident, fluent readers who can absorb and retain new information. Check out all of the step-by-step lesson plans and reading and spelling tips for ONE FULL YEAR. Treat the program like your own, and learn everything the program has to offer. If you purchase from us and decide it's not for you, simply send the package back (in any condition), and we'll refund your purchase price. No questions asked. Choosing the right reading program is an important decision! Check out our Frequently Asked Questions. We want to be sure your child is placed in the correct level, and the placement tests are a great place to start. You can find All About Reading placement tests here. If you have additional questions about placement, please contact us! All About Reading consists of four levels (Levels 1-4), plus a Pre-reading program. Learn more about AAR here. After completing Level 4, your child has all the skills needed to decode just about any word. Read more about what you can do after your child completes Level 4. You can find All About Reading samples here. Our Reading Readiness Checklist can help you decide whether your child is ready to begin the reading program or if your student would benefit from going through our Pre-reading program first. All About Reading is very effective for struggling learners. The program builds a strong foundation by ensuring that there are “no gaps” in your child’s knowledge. Download our free placement tests to help place your student in the right level, and feel free to get in touch with us if you have any questions about placement—we’d love to help! All About Reading is used by students of all ages, including pre-readers, teens, and adults. Can I still buy materials from previous editions? Can the earlier editions of Reading levels be mixed and matched? Yes. Here is the information on correlating previous editions. We recommend spending about 20 minutes per day on reading lessons, but you can adjust this recommendation for early readers or older remedial students. In addition, we recommend reading aloud to your child for 20 minutes per day. Learn more in this article. Fluent reading takes practice. In fact, your child may need to read a word thirty times before he can read it without sounding it out. 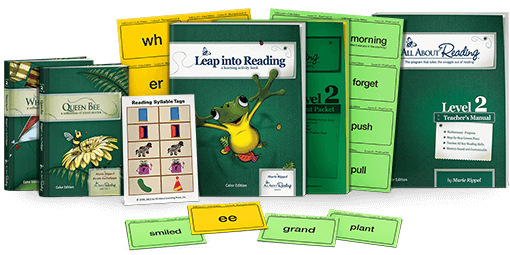 With this in mind, All About Reading uses a variety of methods to help children get the practice they need, including activities and games, letter tile demonstrations, fluency pages with words, phrases, and sentences, and fully decodable readers. You will also spend a few minutes each day with the word cards, which help you track the words your child has mastered and those for which he needs ongoing practice. 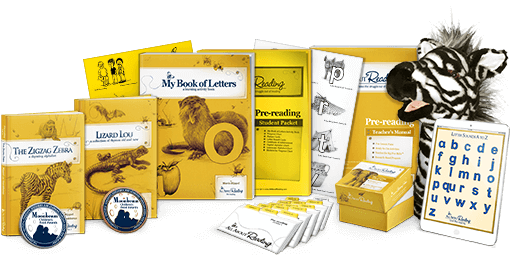 We also include a variety of exercises designed to help your child work on reading with accuracy, meaningful expression, and natural phrasing. 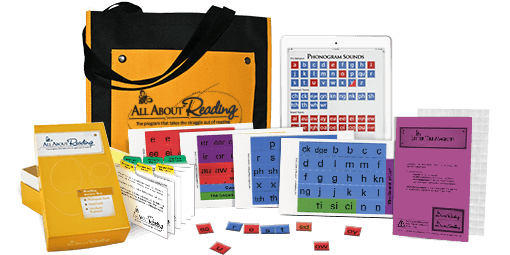 In the All About Reading program, our goal is to minimize the number of sight words your child needs to memorize, while maximizing his ability to successfully master these words. Learn more about our approach in this article on sight words. The ultimate goal of All About Reading is reading comprehension. We cover reading comprehension in every story lesson throughout the program. For complete information and a video, visit How to Teach Reading Comprehension. 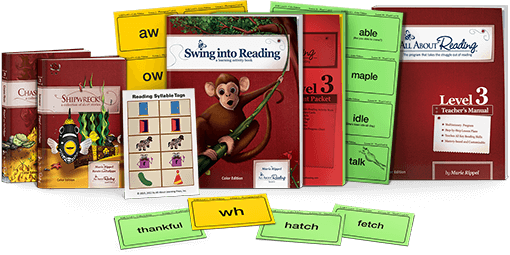 All About Reading teaches a word blending procedure that will break the guessing habit. You can read about it in this article. Do you have more questions? Please get in touch! We're happy to help.